Although my husband and I currently live in an apartment, it has not stopped us from grilling up a storm. Case in point, we LOVE making these turkey burgers. To be honest, I grew up eating red meat every day of my life. Were turkey burgers ever in the picture? No! Since getting married, I've had red meat about 3 times - there are definitely healthier options (but please realize that I'll never turn away a great piece of steak!). We eat a lot of chicken, turkey and fish now - and it's great. Below is a divine recipe for great turkey burgers. Enjoy! 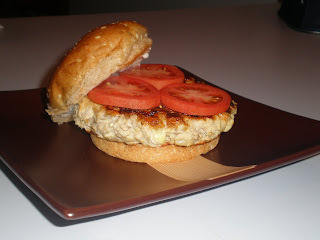 *Adapted from Allrecipes.com - Mushroom Blue Cheese Turkey Burgers. 1. Preheat grill for high heat (or turn on your Foreman!). 2. In a medium bowl, mix together all the ingredients. Form into 4 patties. 3. Place on grill and cook for 10 minutes on each side (or 10 minutes total if using a George Foreman Grill). 4. Serve on buns with your favorite toppings. Mayonnaise and tomatoes are great!